US-led airstrikes have killed 52 Syrian civilians in one day, a monitoring group reports. There was fighting in the vicinity, but the strike allegedly failed to kill even a single Islamist fighter. The US military, however, denies the report. "Airstrikes by the coalition early on Friday on the village of Birmahle in Aleppo province killed 52 civilians," the head of the Syrian Observatory for Human Rights Rami Abdel Rahman told AFP. Seven of the victims were children. A further 13 were buried under the rubble, he added. The scene was precipitated by clashes between Kurdish militiamen and Syrian rebels on the one hand and the Islamic State (IS, formerly ISIS/ISIL) terrorists on the other, about a mile away. "But Birmahle is only civilians, with no [ISIS] positions and no clashes,"Abdel Rahmancontinued, although raids were carried out on a nearby town, where seven militants were killed. “US Central Command can confirm that Coalition forces conducted airstrikes in the vicinity of Birmahle, Syria, on April 30, destroying several ISIL fighting positions and striking more than 50 ISIL [ISIS] fighters,” command spokesman Major Curt Kellogg said in a statement, insisting the 52 people reported killed had been militants. 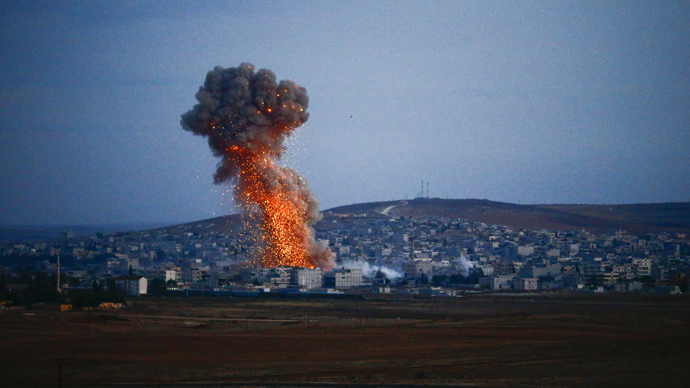 US-led airstrikes have been pummeling rebel positions since September. They are designed to support Kurdish units in Syria and Iraq, who have proved effective at fighting and stalling jihadists, as in the embattled Syrian-Turkish border town of Kobani in January. Friday marked a major escalation in Syrian civilian deaths caused by the airstrike campaign. Since September, the coalition flyovers have resulted in 66 civilian deaths. Friday added another 52.